With intentions of transforming Cowley College's Mulvane Center - Bloomenshine Building into a STEM Center (Science, Technology, Engineering & Math), the College recently conducted successful negotiations with the Mulvane School District permitting Cowley College full access to the facility. Cowley College has conducted classes in the upper level of the building since 2005. This agreement will allow the College to have two additional classrooms and office space in the basement of the facility. Also included is street front parking. 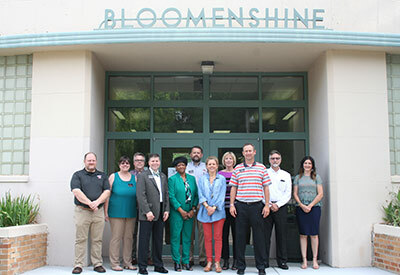 To celebrate the successful negotiations, members of Cowley College’s Administrative Council assembled for their bi-weekly meeting at the Bloomenshine Building in Mulvane on Wednesday, June 21. Cowley College president Dr. Dennis C. Rittle and Cowley administrators worked with the USD 263 School Board to get their support. Dr. Brad Rahe, Superintendent of Schools at USD 263, was instrumental in helping Cowley gain full access to the Bloomenshine facility. Dr. Rahe said the opportunity recently arose to grant the College full access to the Bloomenshine facility. Cowley College currently leases the Mulvane Center - Bloomenshine Building. Dr. Michelle Schoon, Cowley College Natural Science Department Chair, said the Mulvane Center has traditionally been strong in the math and science areas and this additional space to use for instruction will strengthen class offerings in the Mulvane area. “We hope to be able to offer some new programs and to improve services to our students,” Dr. Schoon said. When Dr. Chad Killblane began teaching at the Bloomenshine Building in 2011, he wondered why the College shared the basement of its facility with another organization. Julia Jarboe, administrative assistant at the Mulvane Center, is excited to see what changes are in store for the Bloomenshine Building. “Having the two new classrooms and office space will provide a greater opportunity for growth and to reach our full potential here in Mulvane,” Jarboe said. Jan Grace, Campus Operations Officer of Cowley College in Sumner County, said this means Cowley College is showing its commitment to the Mulvane community. “Cowley College is always looking for more community projects we can do with Mulvane,” Grace said.